This traditional sofa features enough elegance and contemporary flair to make it an excellent addition to formal living settings as well as a cultured option for casual family rooms. 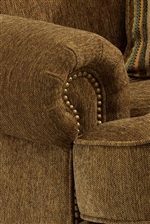 Featuring high-quality craftsmanship, the reigning feature of couches like this is the unique style of their traditional rolled back. 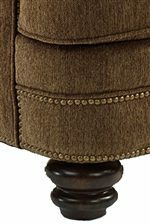 Placing this furniture piece a step above the rest is the superb craftsmanship that is put into making this piece a durably built, time-less addition to your home furniture collection. This living room couch is braced with a high-quality frame, capped with turned wood feet. 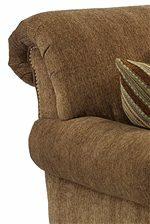 This sofa is one item in a coordinating collection featuring a living room sofa, loveseat, high-leg reclining chair, stationary chair and ottoman. The Fremont 5 Seat Sectional with Left Arm Facing Sofa by Flexsteel at Crowley Furniture & Mattress in the Kansas City Area: Liberty and Lee's Summit, MO & Overland Park, KS area. Product availability may vary. Contact us for the most current availability on this product. 7790-34 RAF Corner Sofa 1 94" 42" 37"
7790-37 LAF Sofa 1 78" 42" 37"